Nigel Adkins said his Hull side should have scored even more goals at the KCOM Stadium. 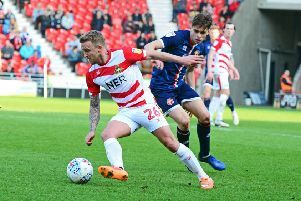 Kamil Grosicki scored twice and Marc Pugh also netted in reply to Lewis Baker’s fine first-half strike to leave the Tigers five points off the play-offs with six matches remaining. Adkins said: “The expectation was for us to get relegated, bottom of the league in October, and we have been on a great run. Grosicki stepped up with two fine finishes as the normally accurate Jarrod Bowen had an off day but Adkins felt the Polish winger should have had a third after missing his easiest chance. Hull paid for not making their dominance tell as Reading went ahead against the run of play as Baker found space 20 yards out and hit a rising left-footed shot into the roof of the net in the 17th minute. In the 65th minute, captain Markus Henriksen fed Bowen and he flicked on for Grosicki. When his low cross found Bowen, his shot was saved by Martinez and Pugh pounced on the rebound. Grosicki grabbed his second in the 77th minute after Campbell sent him clear from halfway to fire home from the edge of the area. Hull City: Marshall, Kane, Burke, De Wijs, Lichaj, Bowen, Henriksen, Irvine, Grosicki (Stewart 89), Pugh (Evandro 86), Campbell (Martin 85). Unused substitutes: Long, Batty, McKenzie, Ridgewell. Reading: Martinez, Yiadom, Miazga, Moore, Blackett, Rinomhota, Baker, Meite (Loader 79), Ejaria, Barrow (Harriott 78), Oliveira (McCleary 78). Unused substitutes: Gunter, Walker, Kelly, Barrett.